A building featuring a giant poster of the PKK's jailed founder and leader Abdullah Öcalan on its rooftop in Syria's northwestern Afrin region was destroyed by a Turkish domestically-developed armed unmanned aerial vehicle. Reconnaissance missions conducted by the Turkish Armed Forces (TSK) detected the monument built on the southern slope of Darmik Mountain located across the border from Gülbaba village of southern Kilis province. 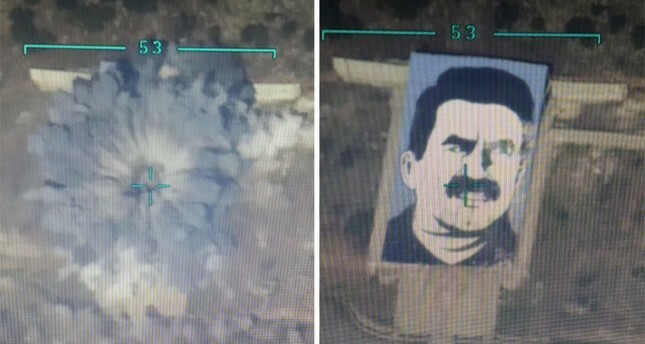 The 53-meter-long concrete building and Öcalan's image was destroyed in the armed drone strike. The building constituted yet another - but relatively insignificant- piece of evidence of the organic ties between the PKK, recognized as a terror group by the U.S., the EU and NATO, and the People's Protection Units (YPG), the main partner of the U.S.-led coalition in Syria. As TSK gains control of YPG-held areas, they have discovered many political documents and images of Öcalan in the terrorists' shelters, underlining the close links between the terror groups. Throughout Wednesday, Turkish air and land units bombarded PKK/YPG elements on Darmik Mountain, which is located some 30 kilometers northwest of Afrin town center. Turkey and Free Syrian Army elements launched Operation Olive Branch on Jan. 20 to clear Afrin of PYD/YPG/PKK/KCK and Daesh terrorists to free locals from terrorist groups' oppression and secure Turkey's border provinces.